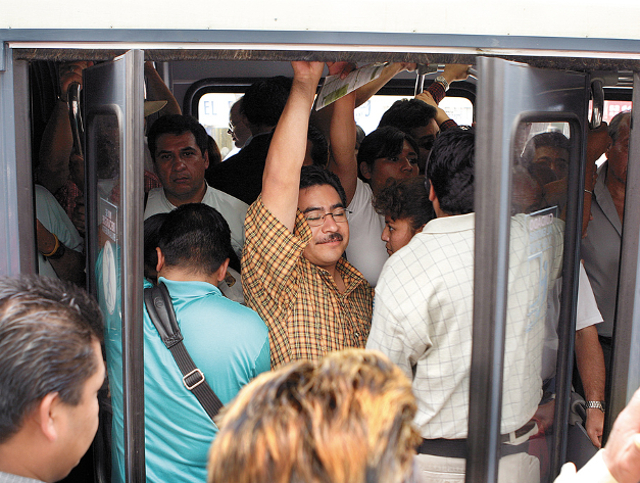 Users wait to board the crowded Metrobus in Mexico City. Photo by EMBARQ Mexico. Increasing the use of public transport is a hot topic in the urban transportation world, and improving the experience of riding bus rapid transit and metro systems seems like a good way to do so. But it is not always clear which improvements are most desired by the riders themselves. Users often complain about being excluded from the decision making process or feel that their concerns are not being addressed. Are planners and users on the same page about how best to improve public transit? To find out, I decided to conduct a little experiment. The idea was simple: ask regular BRT users and experts one question: If you could change 3 things about your BRT system, what would those be? Experts and users alike highlighted three key areas in which they would like to see improvements: the timing of the buses, the payment system for riders, and the physical comfort of the experience. Bus frequency appears to be a recurrent problem for users. “It is very common to see 5 Metro buses passing one after another, and therefore they would be half-empty. Sometimes, however, it takes up to 20 minutes until one passes” says Antonio Olvera, from Mexico City. Experts, like Juan Carlos Muñoz from the BRT Excellence Center in Santiago, Chile are aware of this concern. Says Muñoz, “there should be a control scheme that provides reliability to the trips.” Efforts to solve this problem include apps such as iTransantiago, which provides BRT users in Santiago with timely information about bus arrivals. The LA Metro system provides another solution: a 15-minute map showing buses that arrive in less than a quarter of an hour. Still, the need for regular, predictable arrivals will eventually need to be met. “I would like to add an annual or monthly payment system, just like the ones in Europe” says Ana Mendez from Lima, Perú. Garrone Reck, technical director of Logitrans Consulting in Curitiba, Brazil, expanded on the idea: “There is a need for a policy of discount in the frequent users tariffs. Lower tariffs in the non-peak times could attract more passengers during the idle times, and serve as incentive for time schedules migration, adding flexibility” to the system. Latin American agencies have had a hard time determining reasonable prices that please both the operators and the users of public transit systems. Some transportation experts believe this is linked with the structure of national financing systems for public transport agencies. Most transport agencies in Latin America run under a principle of self-sustainability, meaning they receive very limited subsidies from the government, if any, once they start operating. There is a pressing need to increase the comfort level of the buses. All of the interviewees, both experts and non-experts, spoke of lower occupancy rates, and therefore more space. Many of the suggestions from users addressed similar issues of comfort, including enlarging popular stations, and increasing both the number of buses and the size of each bus. Cities like Lima are already implementing these changes, making improvements to stations such as Angamos by the end of the year. Some other cities have turned to bi-articulated buses to meet demand for more space, as in Curitiba, Bogotá and São Paulo, but many other cities still don’t have them. Making buses more comfortable helps people enjoy their commute, and discourages the use of alternative, individualized methods of transport. Users and experts alike not only spoke of comfort, but the importance of giving the buses a modern feel. Some of the suggestions centered around improvements to lighting, protection from the sun, and even providing WiFi. Among planners and users there is a common desire to improve BRT timelines, payment system, and comfort. Users can be sure their thoughts are being heard and their needs are being advocated for by the transport experts in Latin America. SIBRT and EMBARQ Brazil are working on a satisfaction survey to make sure that users can continue to contribute their feedback. Thank you to Ana Mendez, Antonio Olvera, Garrone Reck (LOGITRANS), Juan Carlos Muñoz (ALC-BRT) , and SIBRT for their contributions to this post.